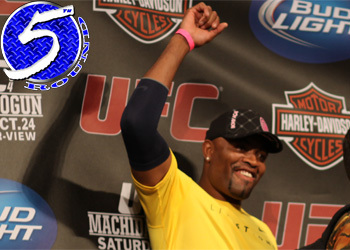 The official weigh-ins for “UFC 117: Silva vs. Sonnen” took place today inside Oracle Arena in Oakland, California. An entertaining championship bout will headline Saturday’s pay-per-view broadcast, as Chael Sonnen challenges middleweight king Anderson Silva for his crown. Sonnen earned his shot at the title after easily disposing of Nate Marquardt, the division’s former top contender, at UFC 109 in February. White is hopeful the Team Quest trained wrestler will be the guy that finally pushes Silva, who has been perfect through his last 12 contests but unchallenged in his last five outings. While he remains the planet’s baddest 185-pounder, things haven’t been completely perfect for “The Spider.” Instead of unleashing the devastating finish everybody was expecting in his last Octagon appearance, Silva opted to taunt and tease Demian Maia for much of their UFC 112 contest to easily take home the unanimous decision victory. In addition, two top contender fights will open for the 5Round affair when Jon Fitch and Thiago Alves vie for another shot at the welterweight title, and Roy Nelson and Junior dos Santos meet to determine who gets next dibs at the heavyweight belt.